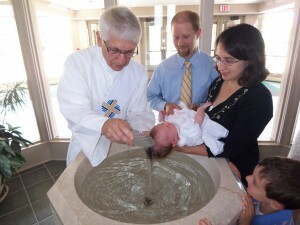 Infant Baptism is discussed and argued about quite a bit in some circles. I was raised Baptist and taught that Infant Baptism was a man-made tradition invented by the heretical Catholics who abandoned the Word of God to follow ill-advised tradition. But not all Protestants reject Infant Baptism. My favorite theologian during my later years as an Evangelical Protestant was Dr. Francis Schaeffer. He actually wrote a booklet on Infant Baptism. Granted, they do not accept the full Catholic understanding, but they did teach and practice infant baptism. Another author that I read was R. C. Sproul. Protestant Reformed theologian R. C. Sproul writes, “The first direct mention of infant baptism is around the middle of the second century A.D. What is noteworthy about this reference is that it assumes infant baptism to be the universal practice of the church. If infant baptism were not the practice of the first-century church, how and why did this departure from orthodoxy happen so fast and so pervasively? “Not only was the spread rapid and universal, the extant literature from that time does not reflect any controversy concerning the issue. . . . Those who dispute the validity of infant baptism make it less inclusive with respect to children, despite the absence of any biblical prohibition against infant baptism” (Essential Truths of the Christian Faith, [Wheaton, IL: Tyndale House, 1992], 228). For my simple article on Infant Baptism, click here. For my blog on Baptism in general, click here. The whole middle section of my book Crossing the Tiber goes into the biblical and early Church teaching and practice of baptism, including that of infants.